For many people, wooden beams are associated with a village house, a stone stove and a low ceiling. In our time, such a view has lost its relevance, although in country houses they still give preference to the fireplace, stove heating and use decorative beams in the interior. These constructive elements fill the room with special charm, create a cozy atmosphere of a good house. 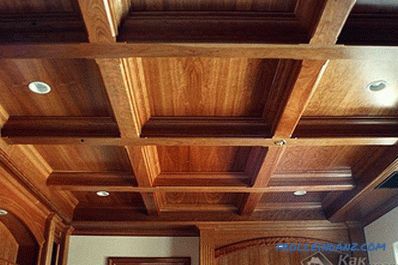 Currently, ceiling beams are used as decorative decoration for ceilings in city apartments and in private houses. 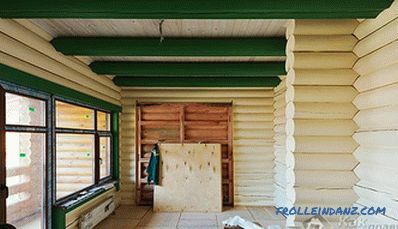 In the modern interior, these materials perform more decorative role than functional, which is why they are called decorative beams. 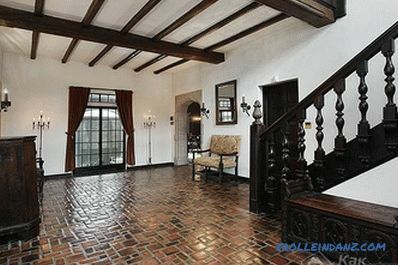 B In rooms with high beamed ceilings, the volume of the rooms is emphasized. If the room looks uncomfortable due to too high a ceiling, the beams are placed low in the ceiling in order to visually lower its level. Thanks to this arrangement of these decorative items, a more comfortable atmosphere is created. 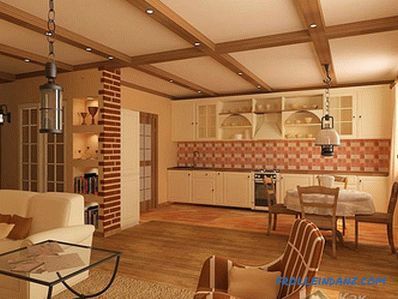 When you design the sloping ceiling of the attic and attic with decorative beams, orderliness of space is achieved. 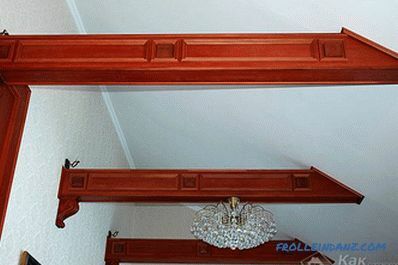 With the help of decorative beams, you can easily and relatively inexpensively create a unique and unique design. Ceiling beams in the interior are suitable for almost any style - from strict classics to modern hi-tech. 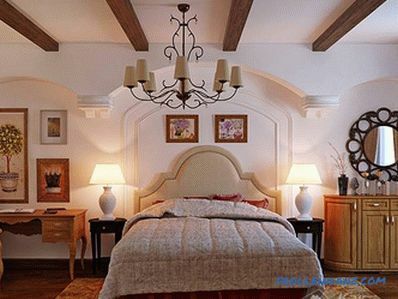 Moreover, ethnic style involves the use of decorative beams. Since luxury is inherent in the classics, beams are decorated with carvings, vignettes, paintings. You can also paint them in soft colors or silver. The classic interior with smooth lacquered beams - white or dark. And in a modern interior, which is characterized by bold decisions and creativity, smooth beams of not only white, black or gray, but also bright colors, for example, red, blue or pink, will look very impressive. Metallic beams or painted metal-like will harmoniously fit into hi-tech or loft interiors. 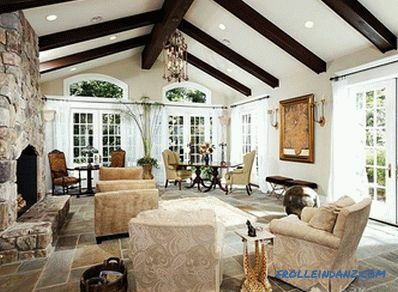 Rural style lovers should use beams with an imitation of an old cracked tree. At the same time, the shades of the beams can vary from the lightest to very dark, be contrasted relative to the interior and not be combined with anything. 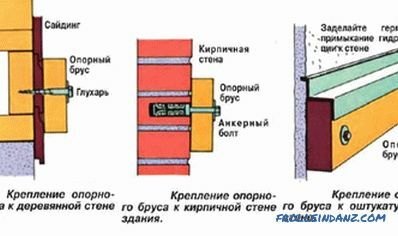 For this purpose, the beam is better to get a rough texture. 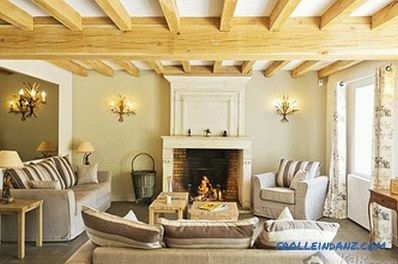 French rural style or Provence is interesting using elegant and neat beams, preferably light, as if bleached shades. Ceiling Contrast beams may attract too much attention. Therefore, it is necessary to take into account, if you need an emphasis on the ceiling, then they should be made contrasting with the ceiling and the interior. Most often in interiors you can observe the ceiling in white, and the beams are dark. But it happens the other way around - on the dark ceiling there are white beams, but this option is exclusively for the amateur. 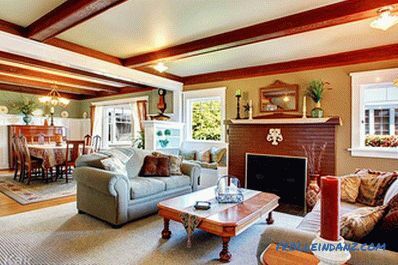 Beams whose color merges with the ceiling do not attract attention to itself, but still noticeable. They make the ceiling volumetric, structural and dynamic. Among such beams, white and the color of wood are most common, but there are also yellow, lilac, blue and other shades on the ceiling of the corresponding color. A very striking contrast is achieved through a combination of different colors, such as the blue ceiling and white beams. 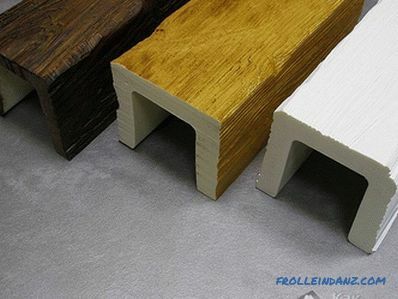 The color of the ceiling and beams depends largely on the chosen interior style, color and material of the furniture. The beams may coincide with the color of the walls, but at the same time contrast in color with the ceiling. In this case, there are many options. When choosing the right color, you should know that the darker beams look heavy on the ceiling and cumbersome. From this, the atmosphere can become oppressive, tough. White beams can appear light, weightless. The interior becomes cool, but at the same time serene and calm. 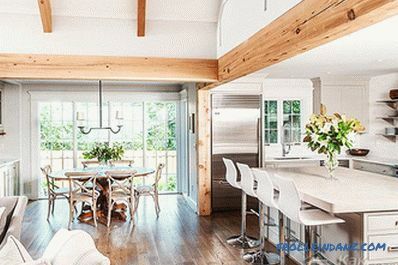 With beams can visually change the space of the room. In order to visually make the room wider, the beams have the width of the ceiling. And if the beams are located along a wider wall, the room will become visually longer. An imitation of such a ceiling is achieved by arranging the beams with a grille or crosswise. This design makes the ceiling surround. 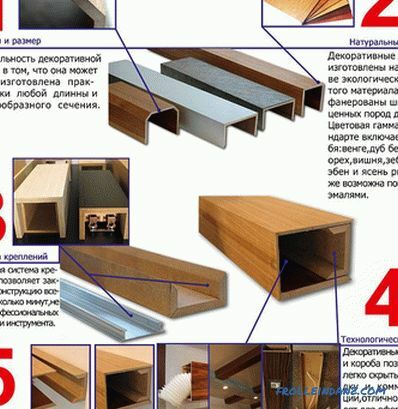 You can arrange beams only part of the ceiling in the form of "lattice", "herringbone" and other figures. Beams make out niches on gypsum ceilings. With one large beam you can divide the room into zones. 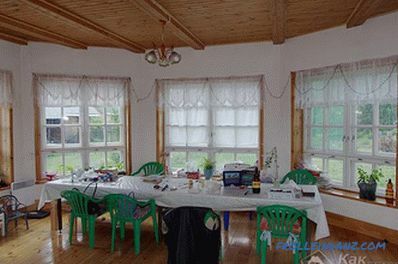 To do this, it is located on the border zones, for example, above the bar or above the dining table. Such dividing beam can be equipped with lamps. Low ceilings can be played as follows: the ceiling beam goes to the wall and it is connected not with the beam, but with a thin bar of the color corresponding to the beam. This way you can visually make the ceiling higher. A too high ceiling can be corrected by lowering the beams and securing them on opposite walls. This method will streamline a large space. 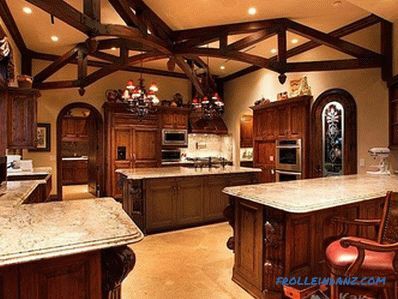 Decorative ceiling beams The kitchen can be equipped with various hooks and holders with utensils, baskets. Holders for glasses can be attached to the beam above the bar - this is both stylish and functional. 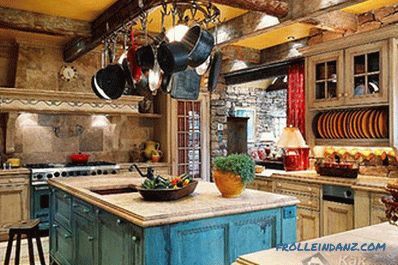 For country-style kitchens, beams can be decorated according to village traditions by hanging dried flowers and herbs. In the rooms of the beam can be equipped with lighting fixtures, securing they are chandeliers or built-in lights. In a modern interior, a loft is enough to throw, tie up or hang up on the beams of a lamp on wires or chains. Beams hang a variety of interior elements. Among them may be photo frames with chains or small shelves on the ropes, and even a TV panel, fixed with a special ceiling bracket. 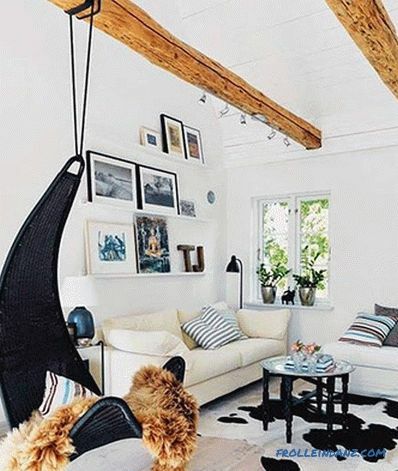 A swing can be attached to the natural beams armchair". This option fits perfectly into the interior of the nursery. Real Nowadays wooden beams are expensive. The use of wood products is aesthetically pleasing, of course, more advantageous, but their choice should be guided by the fact that they are too heavy for the ceiling. 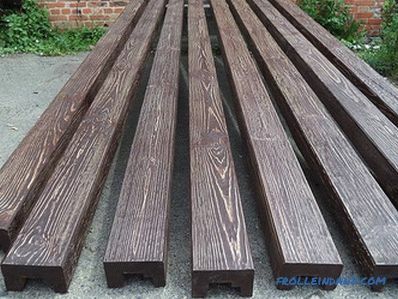 Therefore, there is an alternative solution - imitation of wooden beams, and it is often difficult to distinguish from the present. a variety of designs and colors. 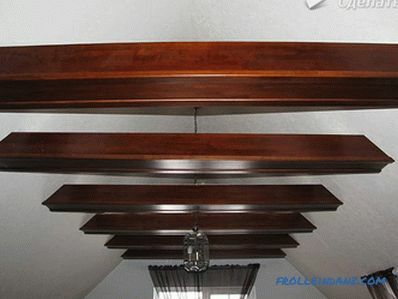 A wide choice of polyurethane products will allow you to decorate the ceiling with beams with imitation of cracked wood or smooth, polished or varnished products. Hollow beams or ceiling false beams with success used for masking wiring or other communications going over the ceiling. Such pseudowalkers are U-shaped, they are hollow inside, so they are used as a cable channel, hiding cables, wires and pipes. 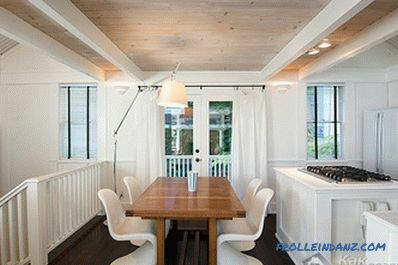 Lighting fixtures can be easily mounted in hollow beams. Mounting a half-pole on self-tapping screws There are different ways to install false beams. 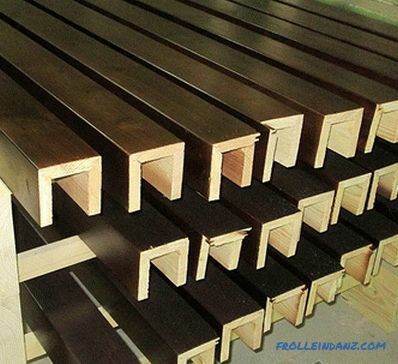 First, in the locations of hollow beams, a crate of wood or metal profile is arranged, after which the beams are fastened to the crate with self-tapping screws. Small beams are sufficient to fix with liquid nails. Heavy beams are installed in a combined way. To do this, you need to fix the wooden bars on the ceiling. The edges of the beam must be abundantly greased with glue and applied to the ceiling. For reliability, the beam can be connected to wooden bars with self-tapping screws. 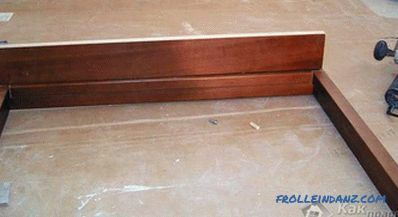 Drywall fixtures made of plasterboard To save money, you can make pseudo-handles yourself from light plywood or drywall. 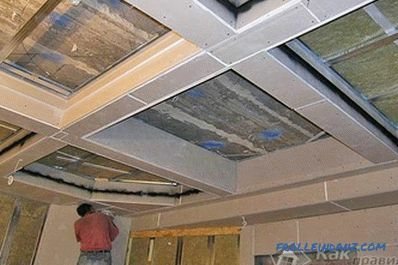 First you need to figure out the size and location of the beams, and then make a marking of the ceiling and installation of frames from a metal profile. Then, the details of the beam of a given size are cut out of the drywall and screw them to the metal frame with self-tapping screws. The result is narrow long boxes.After that, finished products need to be puttied, sanded with sandpaper, treated with a primer and painted. To create a wood imitation, homemade pseudobulks are pasted over with a film under the tree. Such beams look pretty elegant. 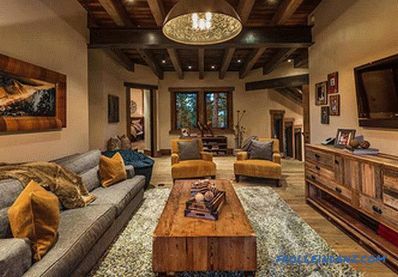 Thus, the design with the help of decorative ceiling beams can significantly change the interior room , to bring more rhythm and graphics into it.